Bob Griese is a former NFL quarterback who played his entire career for the Miami Dolphins from 1967 to 1980. Griese is a two-time Super Bowl champion for Super Bowls VII and VIII plus he is a six-time Pro Bowl selection for 1970, 1971, 1973, 1974, 1977 and 1978. Griese is a two-time AFL All-Star for 1967 and 1968 as well as a two-time First-team All-Pro for 1971 and 1977 plus he was named NFL Most Valuable Player for 1971. He has earned numerous awards and honors including the Bert Bell Award for 1977 in addition to being the NFL passing touchdowns leader for 1977. Bob Griese’s number 12 was retired by the Miami Dolphins in 1985 plus he was inducted into the Pro Football Hall of Fame in 1990. Larry Csonka is a retired NFL running back who played for the Miami Dolphins from 1968 to 1974, the Memphis Southmen in 1975, the New York Giants from 1976 to 1978 and the Miami Dolphins again in 1979. Csonka also is a two-time Super Bowl champion for Super Bowls VII and VIII plus he was named Super Bowl VIII MVP. Csonka is a five-time Pro Bowl selection for 1970 through 1974, a three-time First-team All-Pro for 1971 through 1973 plus he is a Second-team All-Pro for 1972. He is a two-time First-team All-American for 1966 and 1967 plus he was awarded NFL Comeback Player of the Year for 1979. Larry Csonka’s number 39 was retired by the Miami Dolphins in 2002 plus he was inducted into the Pro Football Hall of Fame in 1987. PFP Sports Talent Agency is a top booking agent for motivational sports speakers and sports personalities. 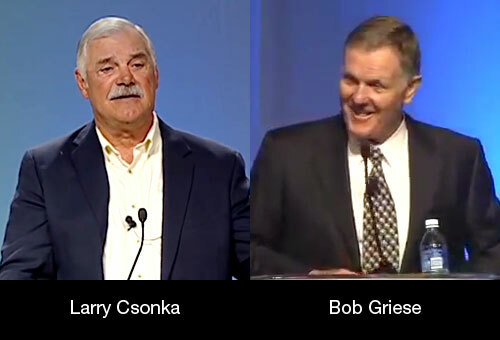 If you would like to book NFL stars like Bob Griese or Larry Csonka for a speaking engagement, personal appearance or special event, you can request Bob Griese or Larry Csonka agent and speaker information from PFP Sports Talent Agency or call 800.966.1380.